Driving off the Chayne yesterday, I put up a family group of four crows. They had been huddled next to the verge, and as they rose into the air, one of them dropped a little bundle onto the tarmac. 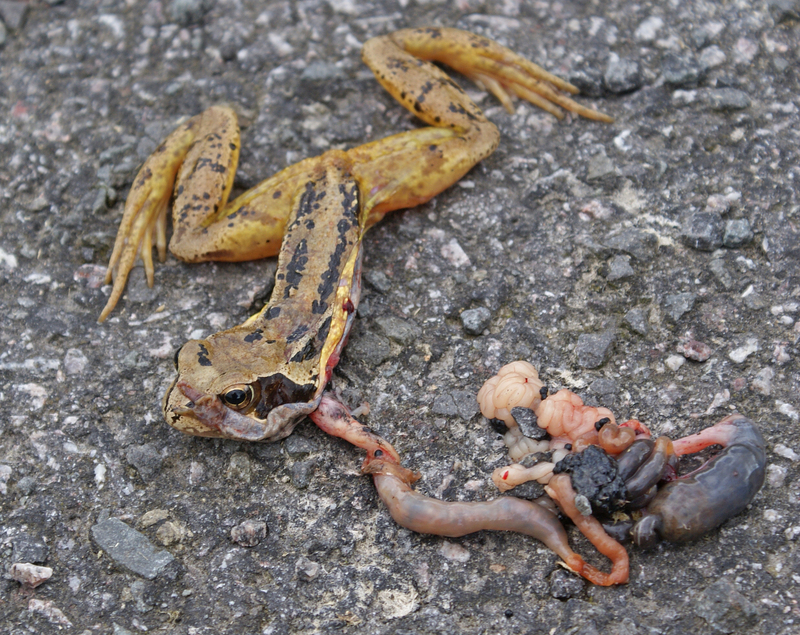 Keen to see what it was, I slowed down and found the tattered remains of a frog. For some reason, I found that I was surprised. Everyone knows that crows will kill small chicks in season, which is why I devote my entire spring to killing them, but the idea that they are active carnivores throughout the year seemed a little surprising. The family had clearly happened on an unfortunate frog and had set about him, meaning not only that they are happy to kill, but that they are real omnivores. With typical amphibian stoicism, the frog wasn’t dead. Even in that state, he still blinked when I touched his eye, and managed to swallow as I scooped him off the road. On the few occasions in my life when I have had to kill frogs, I’ve found the task exceptionally difficult. Perhaps their anatomy is so extraordinarily laid out that their vital organs are tucked away in a secretive corner which I can’t find. I accidentally rolled a boulder onto one last year when I was mending a dyke. The poor little sod had burst open and I tried to finish the job quickly by giving him a decent dunt with the heel of my boot. Half an hour later, I came back to the spot and found that he was still alive, traipsing his puddings across the grass. Despite the fact that my book is formally “launched” on the 9th August, it would seem that some wholesalers have got hold of copies in advance of this date, and to a limit extent, it is now in the public domain. I’ve been giving interviews over the telephone to a variety of different papers and magazines (The Scotsman’s Sunday Supplement “Scotland on Sunday” will cover the book tomorrow) and it really seems like word is getting out. Feedback has actually been encouragingly positive, which is a relief. It’s too soon for the majority of reviews to have found their way into the press just yet, but it’s very odd to think that my work has suddenly been made public. Looking through my presentation copy, it’s odd to see the illustrations which I turned out almost two years ago. Each one reminds me of precisely what was going on when I did it, and several will now be forever linked to the radio programmes I was listening to when I was working on them. Lots of Hancock’s Half Hour, Round the Horne and Steptoe and Son spring to mind when I look over the paintings, but also the specific days when I came rushing off the hill with a specific colour or shape in my mind, desperate to set it down on paper before I lost track of it. 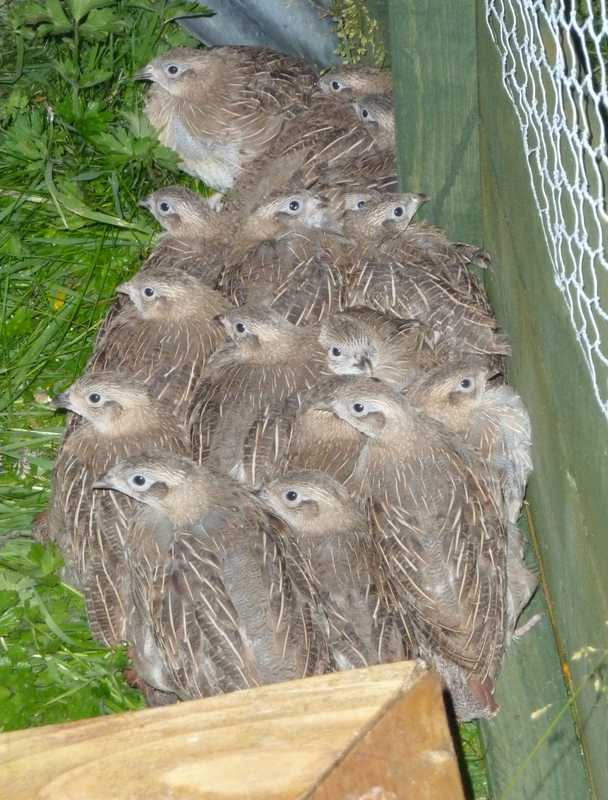 Despite ongoing miserable weather, the grey partridges are doing very well indeed. Touch wood, all are still alive and kicking, and their breasts seem greyer every single day. Some are even starting to grow the classic horseshoe markings, and their calls are getting more substantial than the conversational clucking which was all they were up to when they first arrived. It’s easy to see why people love these birds so much, and I must admit that I’m getting very attached to them. Mr. Lightbody is still standing guard, but over what? Two months after the game cover crop went in, some odd things have happened. One species from the kale/turnip/radish mix has done brilliantly well and some of the shoots are now almost three feet tall, with small clusters of white and pinkish flowers at the end of each stem. The only problem is that I’m still totally unable to tell what it is. The shape of the flower makes me think that it’s a radish plant, but when I pulled one up, there was no sign of anything even slightly resembling a radish below the soil surface. I would have no problem with these plants if it wasn’t for the fact that they are so tall and skinny. 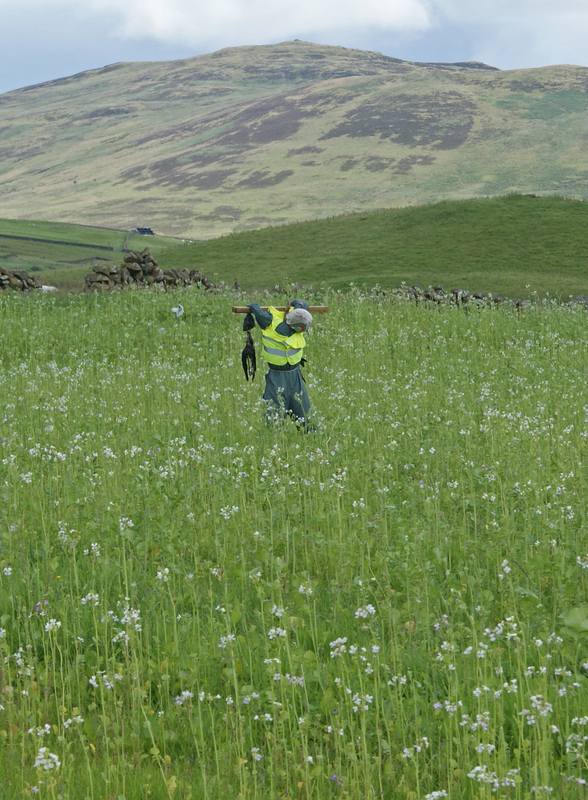 There are thousands of them, but each plant takes up such a small space that it can hardly be called cover. There are few leaves, and they are all small. I wonder if the wet summer has meant that rather than grow small and bushy, the radishes have bolted into leggy weeds without ever having consolidated their progress underground. It’s a bit of a serious question, because unless the radish plants get a second wind and thicken out a bit, the game cover is not going to be able to provide much in the way of cover. There are kale plants here and there, but it’s hard to see why they haven’t done as well as they should have. Perhaps the weather’s been so wet that they never really got out of the starting blocks. There is a huge quantity of turnips, but the pigeons are fixedly eating the tops, leaving the shaws as little more than a tatter of stems. A few have managed to escape the pigeons, and they are now proudly showing purple turnip heads which are almost the size of chicken eggs. The thin strip of triticale has done superbly well, and I’ll certainly have to bear it in mind for the future as having serious potential on the Chayne. In amongst the game cover, the bee mix is starting to crackle into life with spots and blots of colour at around ankle height. The phacelia and borage are coming through brilliantly, and there is a noticeable concentration of butterflies and insects on the field. I suppose that providing a general boost to the local wildlife was the aim of the game from the beginning, so I can hardly complain. I just hope that something steps into the breach and bushes out, because things are looking pretty sparse in the meantime. It’s been raining, so I’ve had time to make up silly pictures. My interview on BBC Radio Scotland was as under-whelming as expected. I sat in Dumfries radio studio and two disembodied voices asked me questions through headphones for about twenty minutes. The resulting dialogue was cut up and put back together again as four minutes. As a result, there are some oddly structured answers and references to things which were edited out. I’m not altogether happy with it, but it’s better than a poke in the eye with a sharp stick. Despite telling friends and family all about it, everyone I know missed the broadcast. 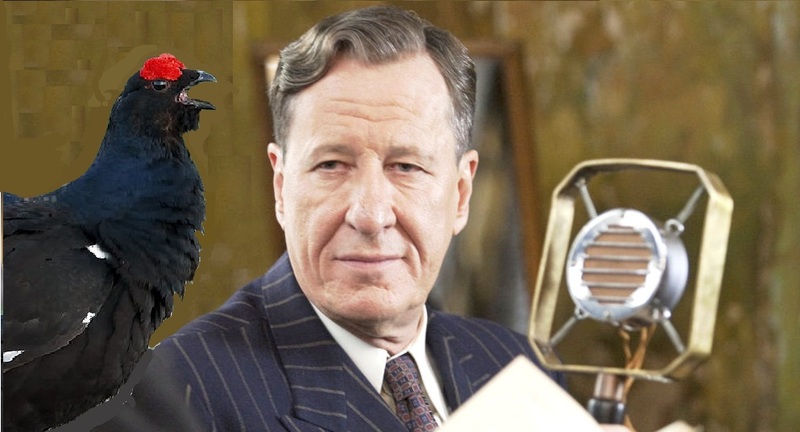 I’ll post a link to it HERE on the offchance that you’d like to hear me rambling on about the misleading concept of my attempts to “reintroduce black grouse in the borders”. The interview is at approximately 0:54:00. An RSPB/FC endorsed gamekeeper makes sure that there are birds for the public to see at the Galloway Forest Park. 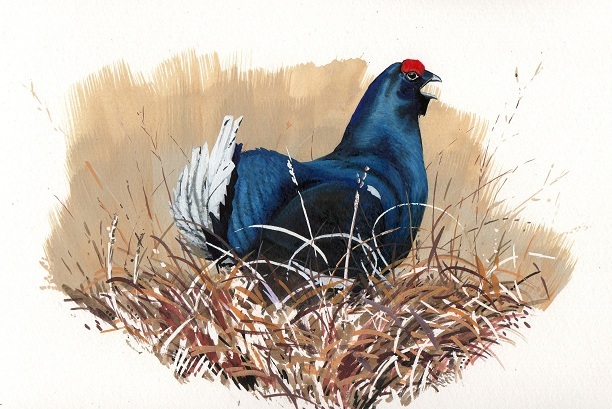 History has shown us that black grouse and commercial forestry do not make good bedfellows. The huge population crashes of the seventies and eighties in southern Scotland coincided precisely with the birth of expansive sitka spruce plantations, and it would be hard to imagine a better way of destroying quality habitat than by draining it and planting it with millions of foreign trees which are used to make low quality wood pulp. Despite the best efforts of public and private forestry workers who consciously tried to stamp black grouse out of existence because they were damaging the new trees, a few birds survived the onslaught. These small colonies of birds now hang around commercial woodlands in Lanarkshire, Wales, the Borders and Galloway as something of a pathetic reminder of just what it has cost Britain to produce moderate quality trees. There are now a handful of tiny, pathetic leks where there were once huge, healthy populations of birds, and in an odd turn of events, the same organisations which caused such damage have now started to half-heartedly endorse the birds as symbols of woodland conservation. The Forestry Commission and the RSPB are frequently seen in each others’ pockets, and the two are now working together in a number of locations to promote the cause of black grouse. I’ve written on this blog before about just how perfectly useless mature sitka spruce are to black grouse, but because sitka spruces are the name of the game for the foresters, these conservation attempts tend to happen in the vicinity of those trees – an attempt to knit conservation into industry which increasingly seems like more of a token gesture than a real dedicated attempt to improve the situation. Even in the last three years, the big leks of the Galloway Forest Park have dwindled ever further, and two of the leks I used to go and see have now become totally defunct. To perpetuate the conservation project, the Forestry Commission claims that the Galloway Forest Park has the biggest population of black grouse in southern Scotland (which is totally false), but is faced with the increasing problem of being unable to show them off. This is largely to do with the presence of 210 million non-native trees, but also has to do with a thriving population of foxes, goshawks, buzzards, peregrines, stoats, mink, badgers, pine martens, crows, ravens and weasels. It’s interesting in this light to realise that after spending a great deal of money on a black grouse “viewing platform” complete with patronising “interpretation boards” overlooking what was a large lek site in the Galloway Forest Park, the Forestry Commission (in partnership with the RSPB) seem to have invested in an unlikely insurance policy. They employ a gamekeeper. The man in question is responsible for trapping crows, stoats and mink, and the presence of a lamping torch mounted on the roof of his 4×4 would suggest that he also trades in foxes. He’s not given official recognition or provided with charity branded clothing or vehicles, but he certainly does receive money in return for killing predators on a part-time basis. The manager of the Galloway Forest Park has told me “face to face” that no predator control takes place in the forest, and there is no mention of predator control anywhere in the Forestry Commission’s literature. It’s certainly not mentioned on the brightly coloured RSPB endorsed “interpretation panels”, but it is happening. 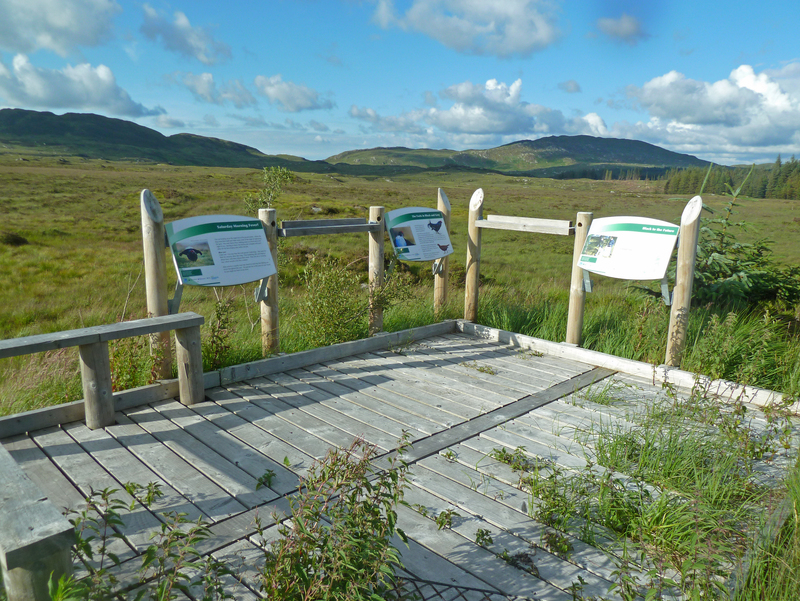 If it wasn’t, the viewing platform would have very little to “view” except empty moorland. It’s too easy to crow over their hypocrisy and say that gamekeepers were right all along. It’s better to let the secret out of the bag in the hope that other conservation projects will see that controlling predators is a vital part of black grouse conservation. You can’t do it on habitat management alone, and in the case of commercial woodland, you can’t do it at all unless you’ve got a keeper on the ground. Just returned from a fishing trip up into the Galloway hills, where wild brown trout were present in their dozens and the constant skreiking of a family of young peregrine falcons only just managed to cover the cackling of red grouse. There were black throated divers on the loch, and it was a thrill to see red deer hinds rise from a bank of bracken above the shore line when the wind blew our boat in too close. 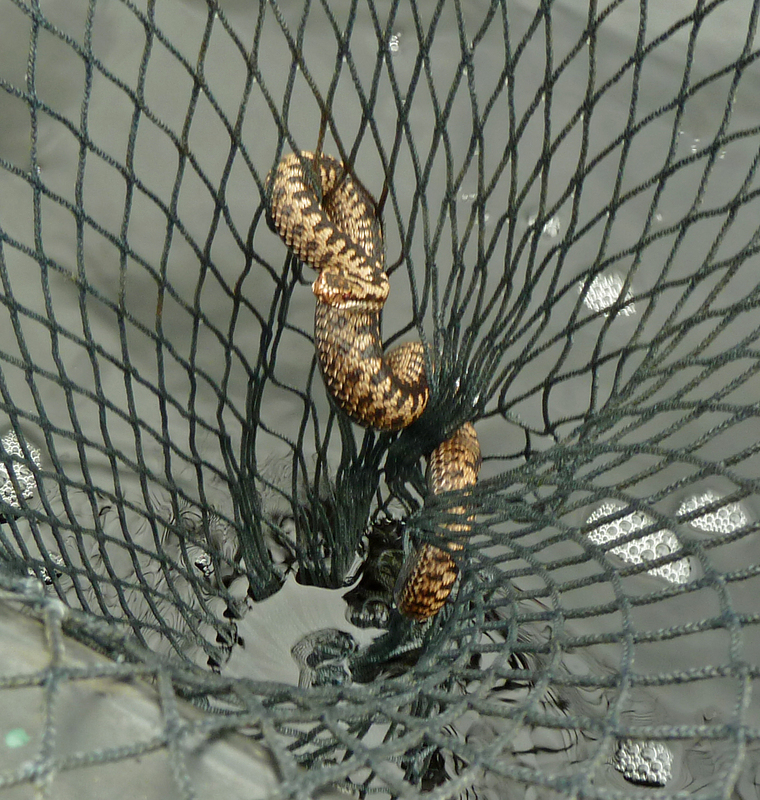 Over two days, I caught more than a dozen little trout, but wasn’t prepared to find an adder bobbing about in the loch without a care in the world. When I spotted it, it wasn’t swimming. I thought it was a stick of heather being blown around in the wind, but when it moved, I had a closer look. 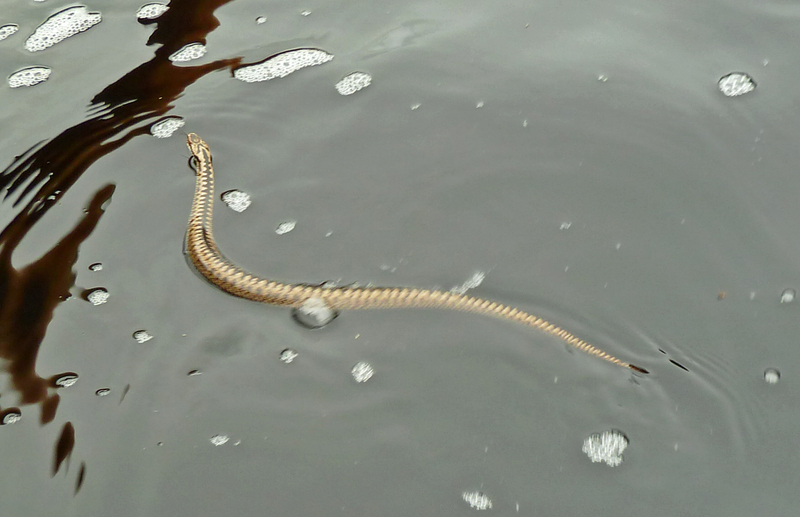 More than fifty yards from the shore of the loch, the little snake was idly passing time in the foamy peat water. I scooped him up in the landing net for a closer look, then slipped him back into the water once I had taken a couple of photographs. It seemed that he actually quite liked being in the net, and was reluctant to leave, but finally slithered away through the waves like a natural. I’ve got no idea why he should have been out in the water, but I’m sure he had his reasons. I turned back to fishing and spent the rest of the day trying to work it out. Moving through the water like a seasoned swimmer.